Today was basting day. Groan...I don't like basting. Before the fun could begin however, I needed to find a fabric to back my quilt. I've heard lots of folks say they put any old thing on the back because no one sees it anyway (especially for a wallhanging, which is what this will be) but it's been my experience that the first thing folks do when they look at your quilt is flip it over to see the back. 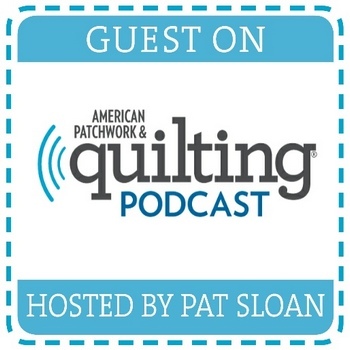 Embroiderers will tell you the back of your work needs to be as neat as the front and this is a good maxim to apply to quilting also. 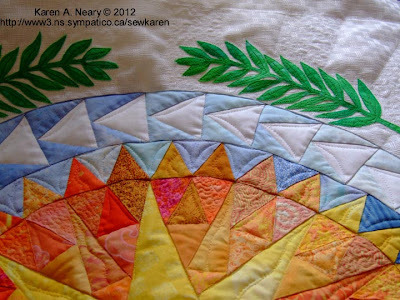 Personally, I like to see the backs of quilts; that's where the pretty stitching shows up, especially on a plain fabric. Since there was nothing suitable in my stash, I headed to Dayle's Department Store. With Doreen's help, I chose a plain royal blue cotton. It picks up the blues in the Plume fabrics beautifully. Even though it will only be next to the binding fabric, they all play nicely together and it pleases my eye. I also chose two spools of blue cotton thread in a shade to match. 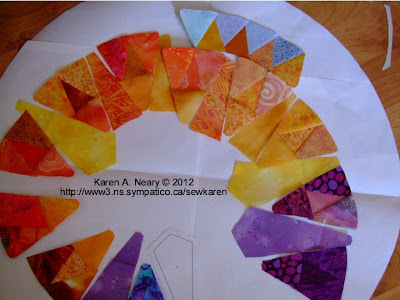 This will be bottom thread only, as I am planning to use a metallic thread for the quilting. Since Polly's arrival in the household, basting has turned into a bit of a blood sport. She has made a frustrating process even more so. I waited until I was sure she was settled down for her long afternoon siesta before I laid out the fabric. I followed the same method I've shown in past posts, securing the fabric to the floor using masking tape. Over this I spread two layers of wool batting. 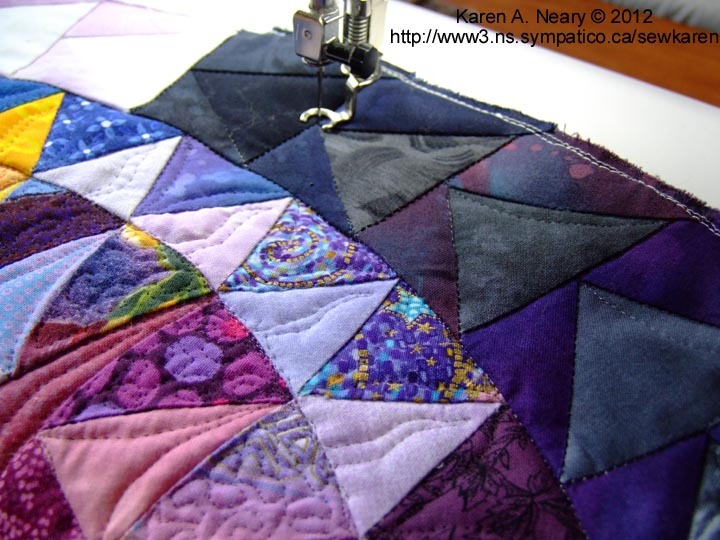 A good hour later, the quilt is well basted and ready to receive some stabilizing stitching. Then the real fun begins. Because I finished the piecing on my latest quilt, I treated myself to a coffee at Tim's. 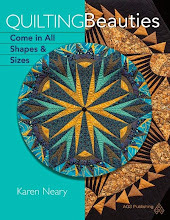 Once the top is quilted and bound, I will find another treat - this one a little more substantial - with which to reward myself. 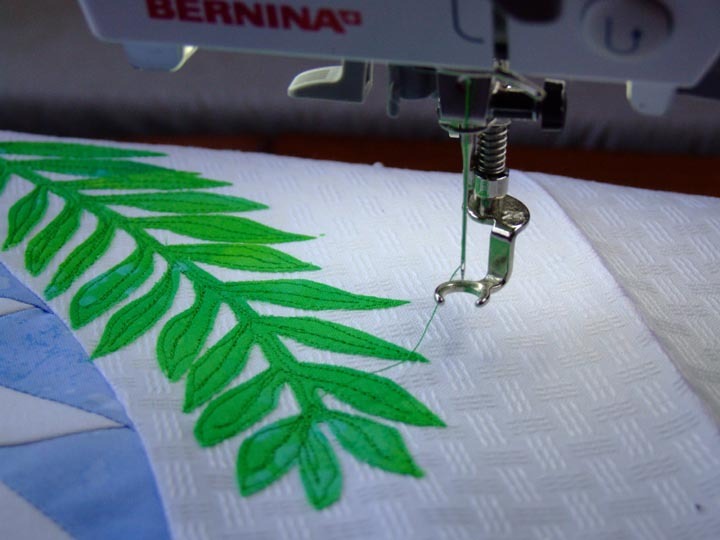 Sometimes I buy a piece of fabric I've had my eye on, or a new foot for my beloved Bernina. This time it may even be new shoes (!) Using this little reward system has really helped me stay on track with completing my projects. Certainly, there's usually more than one thing at a time under the needle here, but they all get finished in turn. There is no closet of UFO's. 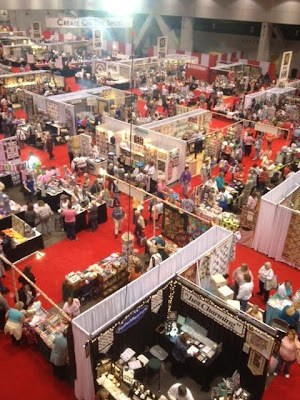 It's raining here this week so it's a great time to be inside sewing. Do you need a new pattern? From now until the end of April (i.e. midnight on the 30th), there will be free shipping and handling on all patterns ordered from the checkout of my website. No need to use a code, the amount will be manually adjusted and credited back to your card as soon as the order arrives. On a fun note, there's an amusing story attached to the above picture of NY Roundabout Again. Normally, I would have secured the top of the quilt to the railing with clear tape to take the photograph. However, it was too cold that day for the tape to stick so we had to come up with a clever way to hold the quilt in place. 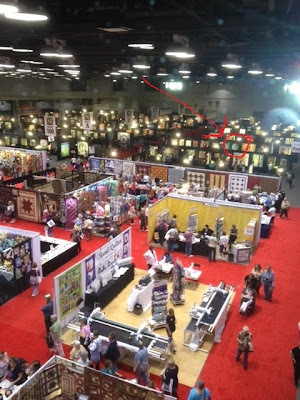 You can't see him, but my hubby is crouched sideways behind the quilt, balanced on one foot so the other one wouldn't show. He said "shoot fast" and I did. The things we do for love, huh? I'm excited to say that I am going on a retreat! 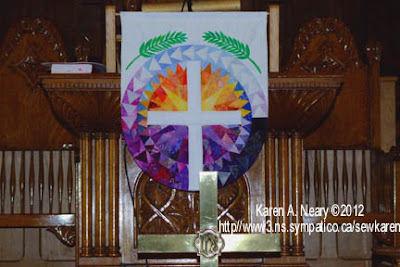 The Mayflower Quilter's Guild of Nova Scotia (of which I am a member) has invited me to teach at their upcoming 2013 retreat. This will be their 14th retreat, held every-other-year at Pictou Lodge, N.S. 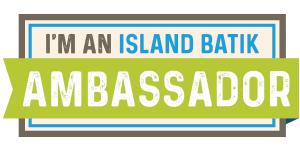 Other teachers on the roster for this event are Cheryl Arkison from Calgary, Alberta and Penny Berens from Granville Beach, Nova Scotia. You can find more information and photos from past years on the retreat blog. Information on the workshops and the Independent Study option will be posted shortly. I understand from others who have attended this retreat that it is an incredible experience, and I can't wait to be part of it. Hubby and I spent the first 5 years of our married life in beautiful Pictou County, living first in the town of Pictou and then in New Glasgow. It will be wonderful to be back. Perhaps I will see you there? In previous posts here and here we saw some very clever quilts made from old neckties by Tina Crowell of Woods Harbour, Nova Scotia. Tina now has her projects all completed. Here is John, the man who owned the 230 neckties from which Tina created her masterpieces. On the wall behind John you can see the boat quilt which was also fashioned by Tina from neckties. The scenes highlighted in the chevrons below were fussy cut from the silk ties. A little before Easter, someone sent me a link to a tutorial on silk dyed eggs which I forwarded to Tina. She used some of the silk scraps to try out the technique. Here they are wrapped up and ready to go into the hot water bath. And here they are fresh out of the water. Once unwrapped, the eggs look hand painted. Aren't they beautiful? I suspect the uglier the tie, the prettier the egg. Thanks so much Tina for sharing your creativity; John is no doubt wishing he had more neckties. 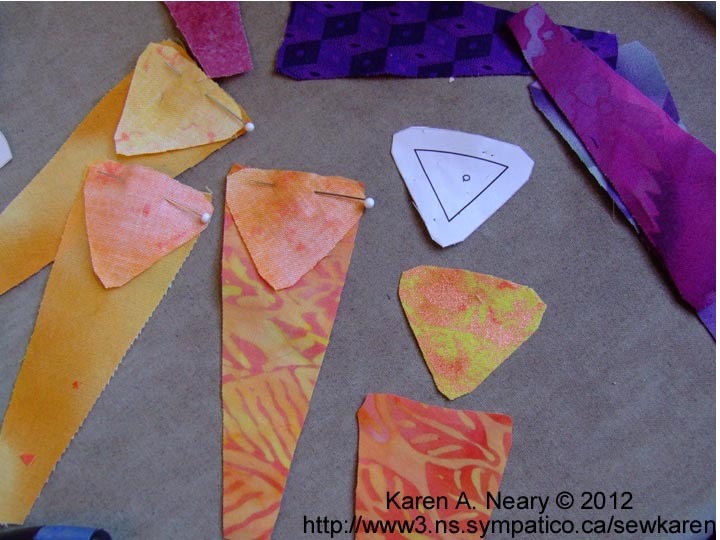 In stolen moments, I am working away at the patchwork with the Plume fabrics from Timeless Treasures. Each one I pick up is more delightful than the last. This blue is my current favourite, it adds such a spark of colour and it's perfect next to that gold-laced black. 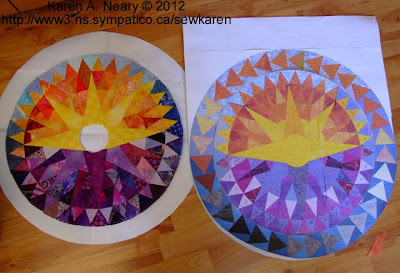 These partially completed sunbursts will snuggle in between the palm blocks when finished, set-in with a "Y" seam. As I stitch, I envision how this piece will be quilted. Already I have chosen the thread - a dark brownish- gold metallic Sulky, which will work well with the gold highlights woven into the fabric. Mentally, I am auditioning feather quilting motifs up the palm branches, meandering out to the elongated tips on the top and bottom blocks. 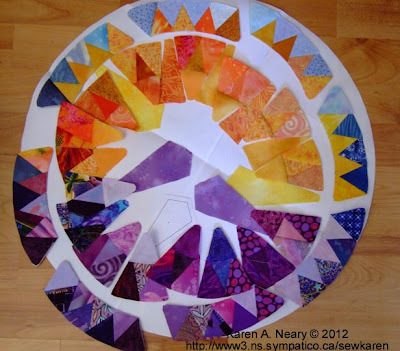 Do you "see" your finished piece and dream your quilting motifs as you stitch the patchwork? Each spring, beekeepers face the gargantuan task of unwrapping, opening up, and cleaning out the over-wintered hives. There's a bit of anxiety involved as one never knows what surprises await. Fortunately, this spring the bees seem for the most part to have survived our very-light winter successfully. The hives were abuzz with activity and happy to be given a bit more freedom. You can see them busily heading in and out the front entrance with the yellow pollen sacs on their legs stuffed full. What a relief to have this big job done. 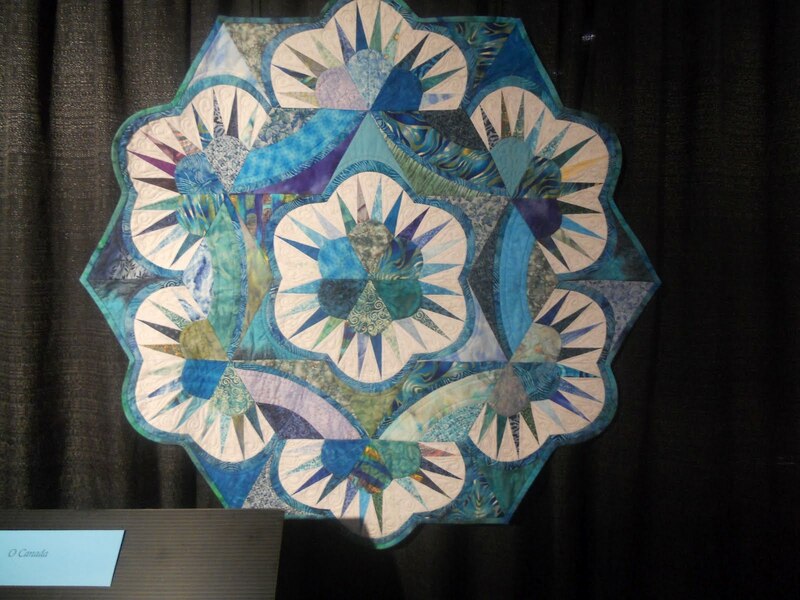 Kathy Lapp from Calgary wowed her guild last Tuesday when she showed up with this gorgeous table set for Show & Tell. Kathy made the set as a wedding gift and chose the fabrics to match her friend's blue and green pottery. Doesn't the black in the centrepiece set off the points nicely? It's lovely, Kathy; our thanks for sharing the pictures. I expect you wowed the recipient! Around The Table has wedge-shaped mats to fit nicely on a round table. If you'd like to make your own set, the pattern is available on my website. Here it is! That's a lot of quilts, and a lot of people! Last year, fellow blogger Katie Wiseman sent me pictures of the "O Canada" exhibit, and I am so pleased she did the same again this year. Here's Farrago hanging with its neighbours. And here's Katie, who looks like she is having a wonderful time! Sincere thanks to both Carol and Katie for sharing these images. It's so wonderful when friends have your back. 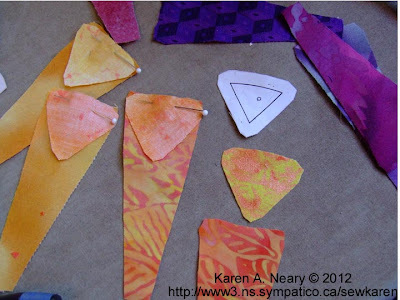 We have a new pattern to add to the Sew Karen-ly Created... line. Yeah! Yesterday I picked up the large pattern sheets from the printers, so the elves and I have been busy folding, stuffing, and filling bags. Here is (NY) Roundabout Again. If it looks a bit familiar to you, there's good reason. It's a new and improved version of the popular New York Roundabout pattern. The block is smaller and has been redrawn to fix some of the awkwardness inherent in the first design. It has a smoother overall flow and is a more practical size. 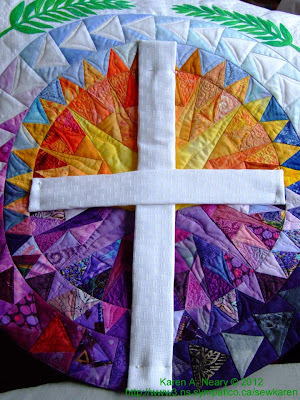 It measures 31" x 50", so is a terrific size for a wall hanging or a table topper. As we learned in previous posts, as copyright holder I am within my Rights to present a derivative copy of the original design. I purposely used dramatic colours so the lines of the design would show clearly, which they most certainly do. Hubby and I took it downtown to be photographed in Amherst's new bandstand in the recently renovated Victoria Square. You can see by the snow that this was awhile back - February, I believe. It takes awhile for things to come together. After reworking the design, the pattern and instructions needed to be verified and two professional quilt testers stepped up to help. Here is the one made by Mavis Shanks from Howell, Mi. Mavis used Northcott's "Stonehenge" line to piece her Beauty. 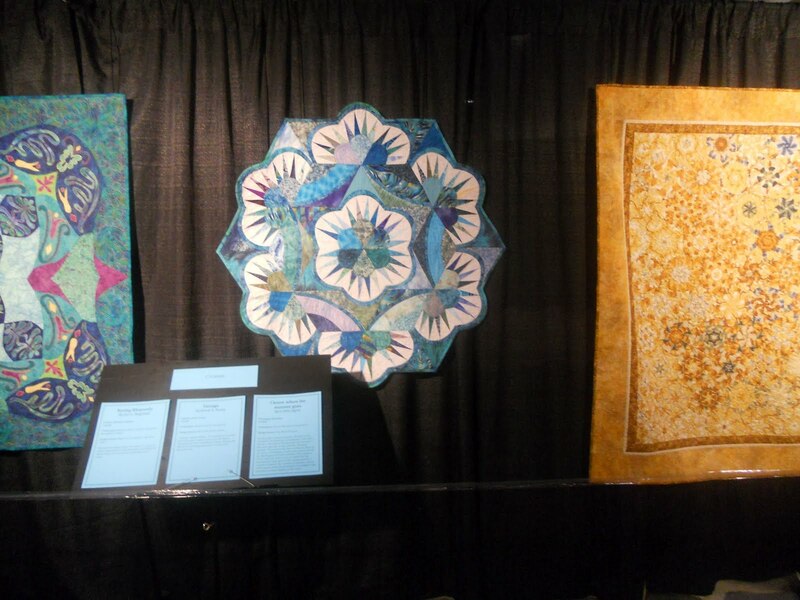 Mavis works as a longarm quilter, so it was really interesting to see the designs she chose to quilt. 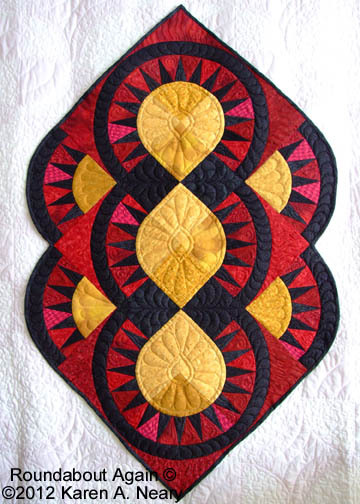 I love that motif in the centre - beautiful work. 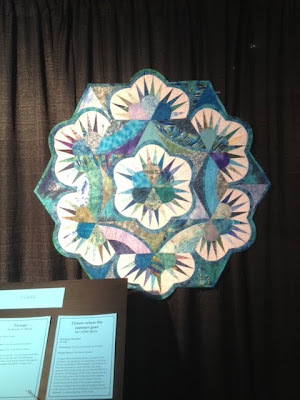 This lovely version was made by Darlene Gerber from Geneva, Ohio. 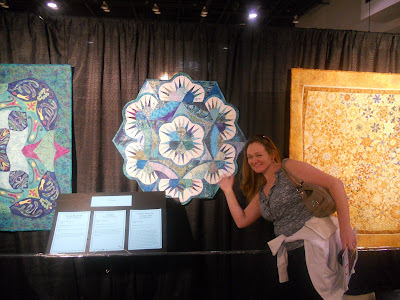 Darlene has a blog where she shows her work, as well as more pieces which she has tested for other designers. I was happy to learn that neither Mavis nor Darlene encountered any issues in making Roundabout Again, and feel confident that the pattern is ready to release. As usual, Polly was involved every step of the way. Here you see her checking the area for stray chickens or mice as we prepare for the photo shoot. Roundabout Again has been added to the Pattern page of my website, where you can order your copy online. I am really happy with the way this piece turned out. In computer lingo WYSIWYG is an acronym for "what you see is what you get"... however my computer experience tells me that what you see is definitely not always what you get. Yesterday I was set to begin sewing the Plume fabrics I bought awhile back. I drew this palm block on a 60 degree grid. Hmmm...I was never good at those spatial orientation things in math class where you are given a flat drawing and asked what shape it would form when assembled. Naturally, I doubted myself and figured the computer was correct in what it had printed. Still...I hesitated to cut into my beautiful fabrics just in case so I printed it again. Same thing. I decided to rotate the block 45 degrees on the screen, to give the block you see on the top below. (the block on the bottom is the orientation I want to piece). When I printed the block turned this way, it came out correct for my purpose...albeit wrong on the screen. I am really glad my brain kicked in before I did irreparable damage to this gorgeous fabric. I have big plans for it. I am piecing the block using templates and my sample turned out great. This morning the first of 6 commissioned paraments was dedicated in church. Besides working within specific measurements, my instructions were, "happy, colourful...and with a palm branch." Here's how I interpreted Easter. Comprised of 252 pieces, the patchwork centre is a traditional Mariner’s Compass block surrounded by a ring of Flying Geese. 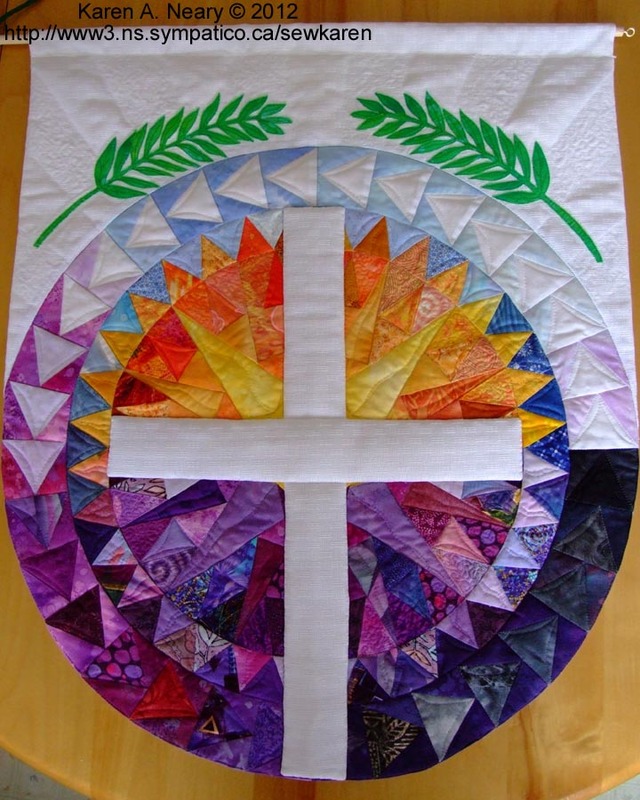 The colours in the outer ring represent the Lenten journey, moving through purple to a single red (for Palm Sunday) and into darkening shades of grey before turning pure white. Palm fronds, reminiscent of laurel leaves, flank the top of the sunburst. Rays are machine quilted in the top section of the hanging. I began with a sketch of the centre section in EQ7. Then I added an outer ring, coloured it on the computer, and printed it out full-size (21-1/4" x 24") to use as a piecing guide. 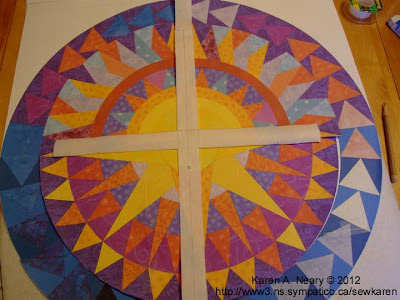 The cross on top is cut from white paper strips. As the work is curved, most of the piecing was done using templates. Some of the subsections were foundation pieced. It grew slowly, but it was pure joy to do. Here's the centre section pieced; it's interesting to see how closely it resembles the sketch. The palm branches were appliqued and free motion stitched. A thin layer of wool batting was added to give the piece dimension. At the top, rays were quilted in the white shoulder sections. 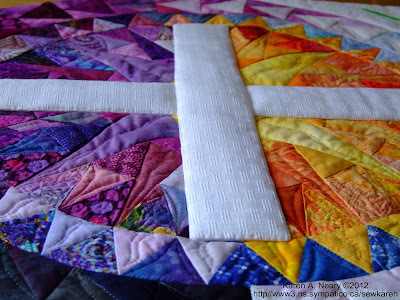 I pondered for some time how to finish the rounded bottom and decided I did not want binding to take away from the design so the backing was added right sides together and the piece was "birthed". The white cross was lightly padded with another layer of wool batt for dimension and was machine blind-stitched to the front. 50 hours later, this was the result. 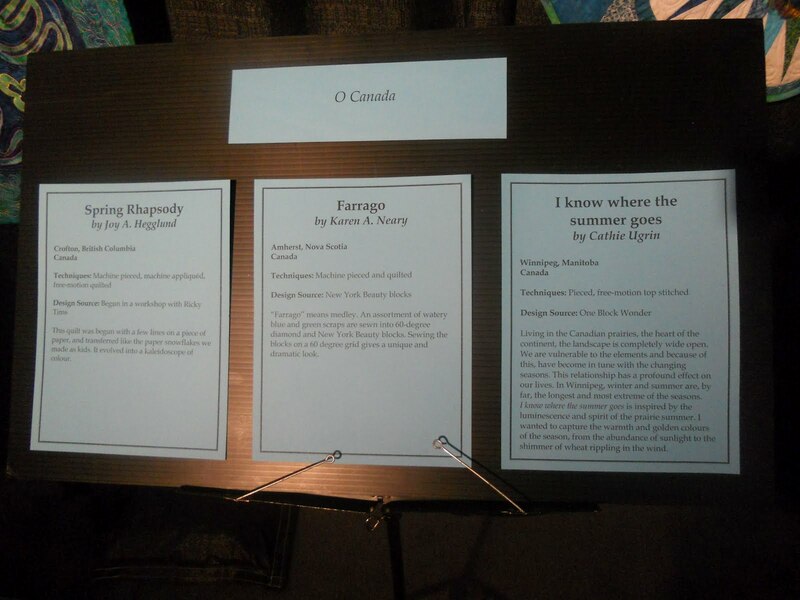 I have to admit, I am pleased with the piece and delighted with the reception it received at the church.